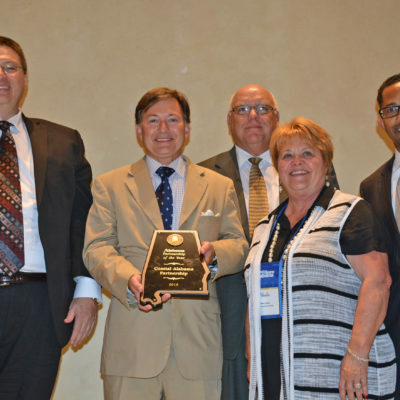 Coastal Alabama Partnership (CAP) has been selected for the Partnership of the Year for 2015 by the Alabama Department of Tourism and Travel. 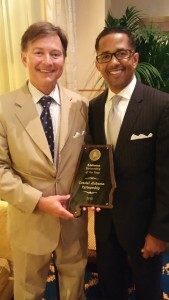 CAP was presented the award by the department’s Director Lee Sentell at the Alabama Governor’s Conference on Tourism in Mobile, Alabama on Monday, August 3rd, 2015. Criteria for the Alabama Tourism Partnership award include “outstanding efforts by two or more businesses, organizations, attractions, events, and/or individuals to combine their resources in creative, innovative, and/or cost-effective ways to promote tourism in Alabama; quality and effectiveness of marketing efforts; and enhancement of local, regional or state image as a tourism destination.” (Alabama Dept. of Tourism). On May 13th, 2015, the RTC, in partnership with Compass Media, officially launched the “first ever” Regional website for tourism in Coastal Alabama: VisitCoastalAlabama.org. This website is a truly historic task as it is the first time Coastal Alabama has put our assets together as one. The site provides the consumer with a one stop shop of information on all tourism opportunities available in our region and shows the world our uniqueness and the diversity of our area as a whole. Since the site’s launch in May, it has developed a growing following on social media forums with over 4,000 likes on Facebook and 256 followers on Twitter. The website will continue to evolve and the RTC is currently working on developing new content for the benefit of both guests and residents along the coast. CAP would like to thank Mr. Lee Sentell for this prestige award and Gov. Bentley for his support of the tourism industry on the coast and throughout the state. CAP would also like to thank the members of the RTC for their efforts that made this possible. Each member’s participation has been key to developing an incredible partnership that continues to strive to make our region a better place to work and play.